He had a net worth of $19 billion as of Friday, according to Forbes.com magazine. Sy's company started as a shoe store in 1948. MANILA: The Philippines' wealthiest man Henry Sy, who rose from being a penniless Chinese immigrant to leading a multi-billion dollar business empire, died on Saturday, his conglomerate has announced. The 94-year-old, from the Chinese city of Xiamen, founded the Philippines' largest shopping centre chain. He died in his sleep this morning, his daughter Teresita Sy-Coson and Jose Sio, chairman of SM Investments Corp. said. Sy had a net worth of $7.2 billion, according to the Bloomberg Billionaires Index, making him the richest person in the Philippines. "This morning Mr. Sy passed away peacefully as a happy man," Sio said. Sy's company started as a shoe store in 1948. Today, SM Investments is an empire that includes SM Retail Inc., which operates the nation's biggest supermarkets and department-store chains; SM Prime Holdings Inc., the largest shopping-mall operator; and BDO Unibank Inc. In the nation of more than 105 million people, his malls attract an average of 3.5 million shoppers a day. "It's not overboard to consider Sy as the father of Philippine retail," said Astro del Castillo, managing director at First Grade Finance Inc. "His grocery, department stores and malls introduced the one-stop-shop concept in the country, and his malls changed not only the practice of retail but the way of life." Sy amassed his fortune against the backdrop of unstable governments, political corruption and economic contractions, notably the Asian financial crisis of 1997-1998. He continued to expand his empire with new shopping malls and a bank that eventually became the nation's largest by assets. Today, the group runs 62 department stores, 56 supermarkets, a network of 194 SaveMore grocery stores and 50 hypermarkets. Henry Sy was born in the southeastern Chinese city of Xiamen, in Fujian province. He immigrated to the Philippines at the age of 12 and started selling rice, sardines and soap at his father's neighborhood store in Manila in 1936. The store was burned and looted during World War II so Sy was called on to sell goods to help the family survive, according to Sy-Coson, the eldest of his six children. 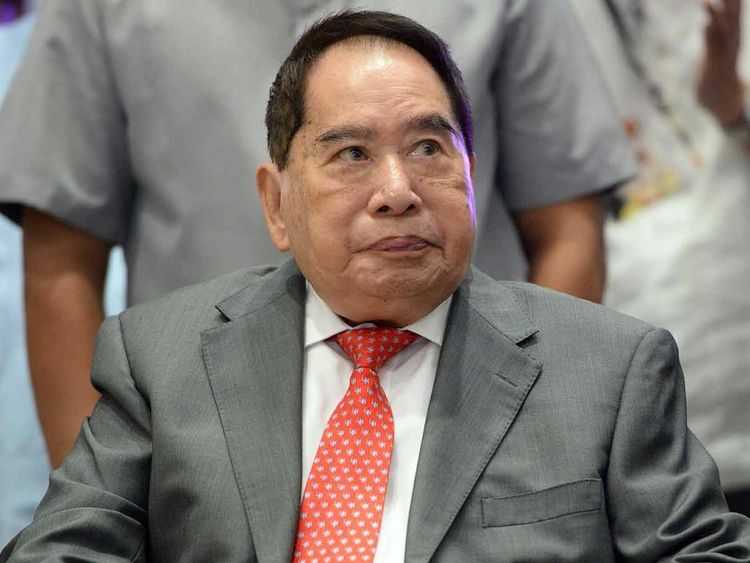 Following World War II, he sold shoes imported by U.S. soldiers and set up of a footwear store, providing him with the platform to later found ShoeMart, the nation's largest chain and the first air-conditioned shop to sell shoes in the Philippines, in 1958. After opening six shoe stores, he diversified the business into clothing and soft goods because shoe manufacturers couldn't meet his demands for higher volumes. In 1972, Sy opened his first department store, two months after President Ferdinand Marcos placed the country under martial law. Marcos was ousted by a military and civilian uprising in 1986. Sy first expanded into real-estate development in 1974 with the founding of Multi-Realty Development Corp., formed to develop high-rise condominiums and townhouse units in prime parts of Makati, a city in metropolitan Manila. In 1976, he bought Acme Savings Bank, which had originally been set up as a thrift bank, and renamed it Banco de Oro Savings & Mortgage Bank. Initially, it provided services mainly to suppliers of ShoeMart. It was renamed Banco de Oro Universal Bank in 1996 when the Philippine central bank gave it the authority to operate as a commercial lender. Sy opened his first shopping mall in 1985, when the economy was in its worst postwar slump. In the late 1980s and early '90s, power outages, a cement shortage and a series of coup attempts that dogged Corazon Aquino's government didn't deter Sy from opening more malls. In 1994, he founded SM Prime to acquire existing shopping malls and land for building new ones from his group's companies. The same year, it raised about 6 billion pesos, about $220 million at the time, in an initial public offering. In 2002, Banco de Oro raised $37 million in an IPO and, in 2005, it took control of bigger rival Equitable PCI Bank. Banco de Oro became the nation's biggest bank by assets in 2008, overtaking Metropolitan Bank & Trust Co. The Mall of Asia, as Sy's flagship mall is called, opened in 2006 with an Olympic-size skating rink, an eight-story movie screen and 800 shops. The $124 million center was SM Prime's 25th mall and was then the nation's biggest shopping complex. SM Investments, which raised $532 million in an IPO in 2005, holds stakes in companies that built a Manila-casino resort with Melco Crown Entertainment Ltd. It also has a stake in Atlas Consolidated Mining & Development Corp.
SM Prime now has 72 shopping malls in the Philippines, making it the biggest operator of shopping centers in the Southeast Asian nation. The company bought Sy's three malls in China in 2008 and has built four more there since then, according to its website. "If I'd be given the chance I'd do it again," Sy said in a July 2009 interview. "Every time the country is in a crisis, I think and decide where is the best way to go. We have to always think of ways to overcome these limitations."